Smith's have managed to outdo themselves with the bag [un]design. There are a few traditional brands that refuse to move with the times or who do not have the resources to employ artists and designers, but Smith's do not have that excuse. There is a giant branding logo. The flavours are colour coded. The Chips type is dominant and there are a pile of out of focus Chips on display. The background is dull beige. So these Chips are ‘Extra Crunchy’ are they? Well, we will be the judges of that. The conclusion after a few samples was that yes, indeed, they were very crunchy. Mostly from the additional thickness, but also by a touch of drying that had quickly absorbed the hardening oil the Chips were cooked in. 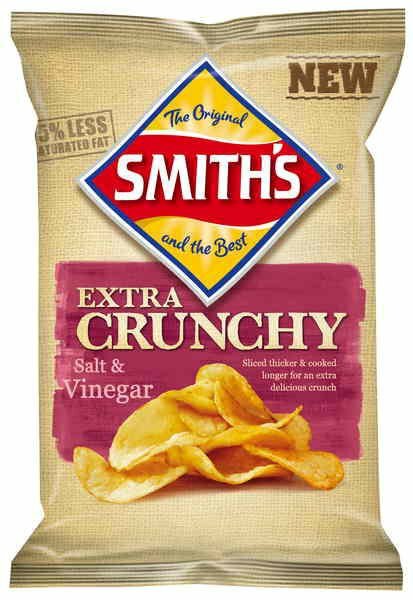 The ‘Extra Crunchy’ means extra thick. And these oil bobbled Chips included bends and curls with plenty of skin on edges. There was some slight browning here and there, but mostly the colour was a pale yellow. A Nose Plunge Test revealed an outstanding salty aroma that was more than touched with nose stinging Vinegar. As Walkers in the UK were one of the originators of this flavour (and these are sold under their branding in the UK), they have every right to claim an original flavour that others should be compared to. These Chips were quite simply excellent. The balance between Wile E Coyote alum mouth shrinking salt and throat stinging Vinegar was equal in consistency and the flavour combination worked to overwhelm but compliment the background potato.